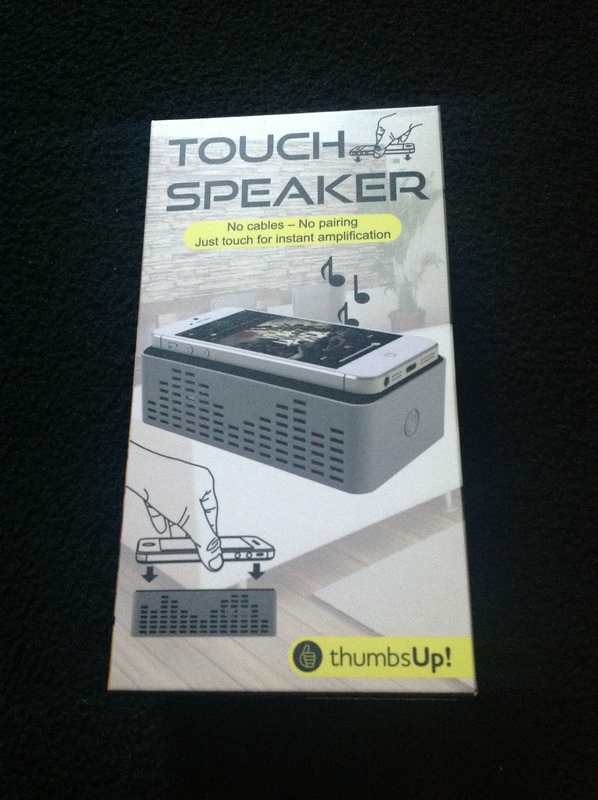 The Wireless Touch Speaker by Thumbs Up is a product sold by The Great Gift Company UK. The product retails for £30, and is pretty competitively priced in the market with a great deal of competition seen online, as well as any local music stores/HMV etc. These sort of devices have came out in barrel loads over the past number of years, with sizes decreasing and more increasingly clever ways of making them portable and wireless. The thing that interested me most about this speaker was the fact that it did not connect to the device it was amplifying by any cables or Bluetooth. I’ve reviewed an amplifying solution that did this before, but never to the extent of this device. It works by claiming to use ‘Near Field Audio’ technology. This means that the device does not connect to the phone or mp3 player, and simply if the device is placed on top then the music is amplified using the inbuilt speakers with the volume being controlled by your device as you usually would. There is also an option to plug your device into the speaker with a Headphone jack on the device, and also an option to plug into DC if you don’t want to use the 3 AA batteries required to use on the go. The amplification is massive, I was astounded as to how loud it was at first. Due to the wireless nature, I had expected to be let down, but I wasn’t in the slightest. The volume can fill a room easily, and for £30 it is a pretty good purchase. The device feels well made, it is simply designed to look at, and includes a rubber band to hold your device to the speaker if you are using this on the move. Discovering a flaw with the NFA technology, the amplification only works when the speaker is directly on top of a certain place on the device. As you can see in the videos posted, If the iPod is turned 180 degrees, no amplification is achieved. This was discovered completely by accident, but I am assuming this is to do with the technology it uses. This could potentially be an issue with centrally located speakers, and I’d also be curious to see how this would work with devices such as the HTC One with front facing speakers. Coming up to Father’s Day, www.thegreatgiftcompany.com has lots of great items that anybody would be thankful for and reasonably priced. If your looking for something unusual or unique, I’d recommend giving this website a look, especially if your stuck for ideas as there is a lot of items that will spark anybody’s imagination !